I have been MIA for approximately four months. During this time I finished writing the first part of a research project (I’m a student at Tohoku University in Sendai) and I travelled inside and outside of Japan. And I read a lot of books. No less surprising, perhaps, the toll that the research project took on my daily life compounded by the exhaustion and mental depletion following its culmination were sufficient factors in my decision to temporarily abandon this blog — until today. Two weeks ago I had just returned from a trip to Hokkaido. I moved around the desolate and frozen landscape visiting Sapporo, Abashiri, Hiretokoshari and Otaru. It felt like traveling through a black-and-white Japanese film. Flashbacks of Yasunari Kawabata’s Snow Country (which I haven’t read since my undergraduate days) were unavoidable even if that novel was set somewhere in Niigata Prefecture. In Sapporo and Otaru I went to the local museum of literature to see the displays of one of my favorite Japanese writers, Kobayashi Takiji. The following photos are from Hokkaido Museum of Literature (北海道立文学館) in Sapporo and Otaru Museum of Literature (小樽文学館) in, well, Otaru. Kobayashi Takiji was given prominent place in both of these establishments. That’s the main reason why I paid them a visit. Seeing all those old books written by him and reading all the voluminous information scattered on posters, banners, old newspapers and in photographs made me think of Kobayashi’s magnificent book I read with enthusiasm while vacationing in Singapore last December: The Crab Cannery Ship. But it also conjured the deep resentment I feel for the dissonant history of nationalistic nostalgia that has made such a strong comeback under Prime-Minister Abe’s administration. You only have to walk into a regular Japanese bookstore or pick up a newspaper or switch on any channel of the (predominantly) right-wing media to see what I’m talking about. Kobayashi’s undiluted presence in Hokkaido and the frozen sprawling spectacle peopled with charming inhabitants made me forget for an insular moment the vicissitudes of the Japanese “mainland.” But I want now to talk a little about the book. 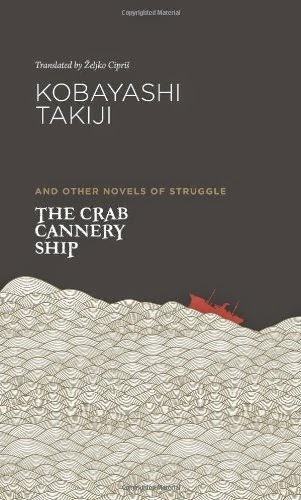 Kobayashi Takiji’s The Crab Cannery Ship, in the fresh and exuberant translation by Zeljko Cipris, is more than an established example of the proletarian current that swooped on Japan during the 1930s: it is an explicit articulation of seething outrage as well as indictment of the domestic and international villainies carried out by Japan during the early Showa period. Moreover, it is a condemnation of the capitalist system which rises above insipid demagoguery due to its unique literary value, a fact illustrated by the notable currency and recognition the novel acquired in 2008 after being propelled to the status of national bestseller. This noteworthy media reclamation of a workers’ struggle aboard a cannery ship doing its rounds near Soviet shores is indicative of a general global revival of politically-loaded and humanistically-inclined notions of solidarity, struggle and class. Norma Field and Heather Bowen-Struyk do a far better job of explaining the social, cultural and economic issues underlying this unanticipated Takiji “boom.” Instead, in these few lines I would like to concentrate on the unprecedented intensity of criticism which Takiji leveled at imperialism, the army, capital, labor exploitation and, most outrageously, the Japanese Imperial family. The fact that this novel was published, even in censored form, is an amazing oversight on the part of authorities who began to crack down on leftist ideas following the promulgation of the Peace Preservation Law in 1925. I want to enumerate here my favorite passages from the book, all of which reveal Kobayashi’s heroic streak bordering on madness and, naturally, bringing the outrageous truth to light. There are also a few passages that offer a counter-history to the established knowledge about the development of Hokkaido which runs against the glorified selfless, patriotic acts captured in various national museums (one that jumps into my mind is the Abashiri Prison Museum, 網走監獄, which I recently visited). But I’ll let the text to do the rest of the talking. Every year as the fishing season drew to an end, it was customary to manufacture some cans of crabmeat to be offered to the Emperor. Yet not the slightest effort was ever made to precede their preparation with the traditional ritual purification. The fishermen had always thought this terrible of the manager. But this time they felt differently. Such were their feelings as they packed the cans for the Imperial table. And lest anyone thinks that Kobayashi Takiji had only the interests of his fellow *men* on his mind, then check out these passages from the novella Yasuko. Kobayashi can quite realistically rival the astuteness for anthropological analysis of any social scientist of his era (Hosoi Wakizou and Yasoo Kusama come to mind) and his feminist sympathies and support for Japanese women's social, economic and political emancipation are unmistakable. Okei had never before heard such talk. Although this was her first time, she felt she understood its meaning as accurately as if it had struck some measuring instrument within her heart. And finally there’s the straightforward unveiling of Japan’s overseas intentions and the deluded utopian ambitions that saw a lot of left-leaning humanists abandon their homeland for the harsh, barren wastelands of Manchuria in order to build a better society with the support and/or in the name of his majesty, the Emperor. Takiji Kobayashi. The Crab Cannery Ship and Other Novels of Struggle. University of Hawaii Press, 2013. Bowen-Struyk, Heather. "Why a Boom in Proletarian Literature in Japan? The Kobayashi Takiji Memorial and The Factory Ship." The Asia-Pacific Journal 29 (2009). Field, Norma. "Commercial Appetite and Human Need: The Accidental and Fated Revival of Kobayashi Takiji's Cannery Ship." The Asia-Pacific Journal 8 (2009). Many thanks for this piece, glad to see you back posting again, I really need to track out a copy of this seminal book, I've read online excerpts and other stories from older translations, but need to catch up with this new translation, thanks again. It's good to be back. Thanks for the support. I also need to purchase a couple of the books you've covered in your blog. I'm lagging behind in literary material.